If you are like me you do not know how to go out for an extended period of time without a completely unnecessary swath of different gadgets, cables, batteries and other tech gear, than you may be interested in what I am sharing with you today. Before I get to the goods though, let me set up the back story and reasons why I am very interested in this product. This summer we took two extended vacations and each time I left home with at least 4 phones, 2 cameras, 2-3 laptops, several cables, portable batteries, SD cards, etc. Did I need all this stuff, maybe not? Did I want to have all this stuff because I have an issue where I over pack on the tech side, maybe...probably...ok, yes I do. Why tell you this? Well, taking all of this stuff isn't such an easy task when the bag you're using isn't designed to handle everything you're going to throw at it. Of the several backpacks and messenger style bags, I have available, not one has the right amount of storage, or is not the size, or isn't comfortable to wear for long periods. The bag I elected to go with on each trip was a standard run-of-the-mill laptop backpack with a handful of generic, yet mostly useless compartments. It simply doesn't cut it. That is where the HURU backpack comes into play. Read on the learn more about this incredibly versatile pack. Oh, and in case you were wondering what HURU stands for; I know I certainly was. "HURU" is Swahili for "free" or "freedom". Why that name? Keep reading, I think it will all make sense after seeing everything HURU has to offer. The belt, which can be transformed into a detachable waist bag. Just take it off, put your wallet, bank cards, phone, keys and other valuables in it and go on exploring the city while leaving your backpack safe in the hotel or in the car. Water-resistant hood stored in the backpack, ready to protect the owner from unexpected showers. HURU backpack opens like a suitcase, which makes makes packing for a trip very easy. HURU’s capacity is 22 liters and it is expandable to 40 liters in one simple move. Backpack fits into the hand luggage compartment on the airplane, so your belongings are always with you during the flight. Each strap has a secret pocket for keys, bank cards or an ID card. These pockets can easily be accessed by the backpack owner, but not by a thief. In addition to the main section of the bag, HURU has two extra compartments: one for a 15 inch laptop and a smaller one for a book, a tablet, or some documents. The backpack also has a separate roll-up compartment where you can store items up to 20.6 inches (53 cm high), such as a tennis racket or a skateboard. There is a special heat insulating compartment to store drinks. The HURU back appears to be the bag that is trying to do it all. It checks almost all of the important boxes when looking for a good gear bag and it is also doubling as a suitcase making, what I think, maybe the perfect travel luggage. For me, a few of the most notable features are water-resistance, a dedicated documents compartment, ergonomic backing and chest and waist support. The high-quality aluminum fasteners are also an excellent touch. If this bag is going to handle everything the team behind HURU intends you to, the zippers and fasteners must be built to last. The HURU bag also includes another incredibly useful feature. The bags belt is detachable, turning into a shoulder-sling or waist-pack of sorts which would be very useful to someone such as myself when out-and-about with my wife and kids. Keeping my phone, wallet and keys in a pocket is not always ideal or possible depending on the outing. I can see this being just as useful as the backpack itself on many occasions. Long story short. This backpack is built to last! Where Can I Get My Own HURU? 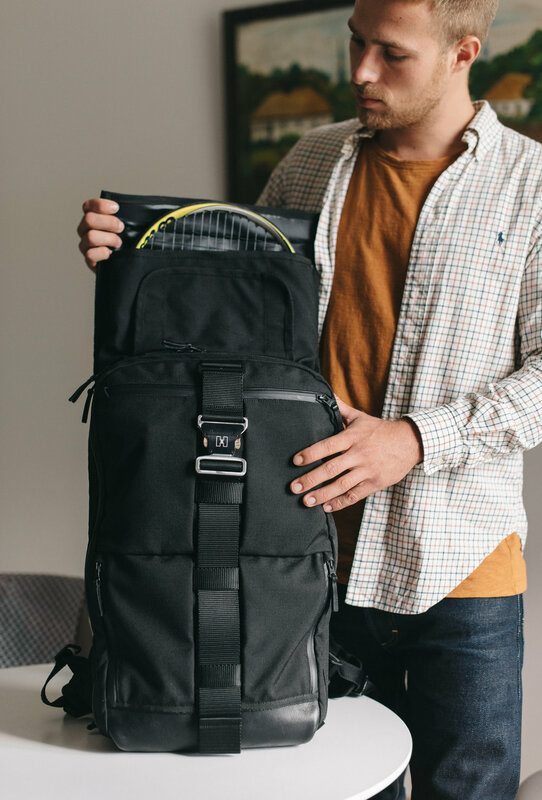 The HURU backpack, as mentioned, launches on Kickstarter today and backers looking to snag a HURU can pledge $250 for one backpack and up to $2400 for a set of ten backpacks. The HURU team plans to ship early bird backpacks in December of 2017, with the remaining packs going out around February of 2018. If you would like to contribute to the HURU campaign head over to their Kickstarter page HERE! Don't forget to check out the HURU launch video too! "I want our customers to enjoy the combination of functionality and awesome design that HURU embodies. We made sure that our backpacks look and feel great both on the inside and on the outside." Head over to the HURU Kickstarter page to learn more and back this awesome project! What do you think of the HURU backpack? Let me know in the comments below!